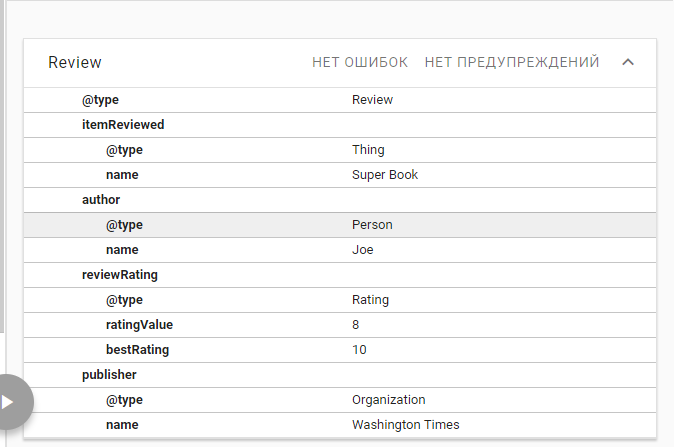 I'm following Google's official examples to make JSON-LD markup for reviews and test in Google's structured data testing tool. When making list of reviews for the same organization (all reviews are about the same organization), the testing tool shows duplicates. Results: Google correctly detects two reviews of a Book with single reference to the Books name in each review. Now I just change Thing to Organization, and what I get is a mess. Four times for two reviews. When I add a hundred of reviews, each will contain hundreds of references to the organization. Why is it such a mess? if this affects the code, how fix it? This was not the only change. Your second example also contains an @id for every node about the company. It’s a good practice to provide such node identifiers. In your case, it conveys that all reviews are about the same company, and that the reviewed company is also the publishing company. It should not be relevant how Google’s SDTT displays it, as long as it doesn’t display something that’s wrong. It seems to display all properties from all nodes with the same @id, even if they have the same value (like they typically should have). It’s just a display issue, nothing wrong with your data. There is a way that doesn’t require you to add a full node every time you want to say someting about the company: use @id to reference the full node. This doesn’t only save space, and avoid possible data duplication issues, it also gets rid of the display issues in the SDTT. You can find a full example in this answer. Not the answer you're looking for? Browse other questions tagged schema.org json-ld google-rich-snippets-tool or ask your own question. Schema.org for artist portfolio website: WebSite, Person or Place type? 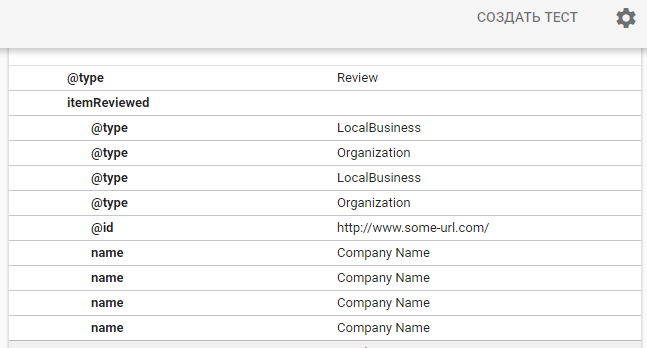 JSON-LD x2 Local Businesses from same Location? Do I respect schema markup best practice? Do AggregateRatings counts in Recipes need to be in Review markup?